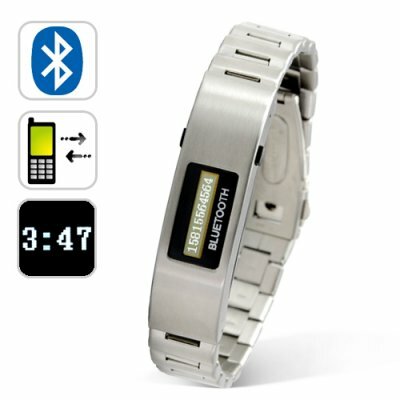 Successfully Added Bluetooth Bracelet w/Vibration Function + Digital Time Display to your Shopping Cart. Bluetooth bracelet with vibration and caller number display for ultimate convenience. Tell time as well as receive vibration alerts when you get a call. This double combo Bluetooth bracelet is made with all round stainless steel for extra durability, without compromising on performance and looks. Have you ever missed a few calls on your cell phone? Then this new Bluetooth bracelet is bound to be your new best friend! It comes in a nice looking stainless steel metallic finish and is both comfortable and fashionable to wear. Just use the Bluetooth bracelet as you would a normal Bluetooth device. It's very simple and very straight forward to use. The Bluetooth bracelet vibrates when you receive calls and displays the caller ID's number so you can decide whether or not you want to fish your phone out of your pocket or bag. This Bluetooth bracelet not only looks cool, but also makes your busy life just that much easier to handle. The CVFM-B13 is available now for your single piece sample or stock orders. Brought to you from the leaders in factory direct china wholesale electronics, Chinavasion. How do I pair this Bluetooth bracelet with my phone? When the bracelet is turned off, press and hold the button on the bracelet until the screen displays"Pairing." Only let go of the button once the screen shows "Pairing." Then you can connect your phone to the bracelet just like you would connect to any other Bluetooth device. Will the bracelet display my contacts' names? No, it only displays the phone number. on 2010-07-29 08:56:42 Not bad item. Good for when you cant hear the phone. I received my bracelet, and it workes, but I would have prefered a bit more vibration. But it is good for my workplace where I can't have a phone ringing. I got the first gen of this watch that just showed the caller ID phone number, when it could stay connected... I was very disappointed with that product. This one is far superior and has the features that make it worth the $$$. This bluetooth bracelet is not LCD, but still the OLED. It has its own blueish-hue-glow all the time. I say again, not LCD, there is no back light, each pixle glows on its own. The connectivity is excelet compared to the first gen. As well the clock feature is worth EVERY PENNY. Caller ID shows up still as a number (unless I am doing something wrong with my LG-Incite). The battery life appears to +50hours (the longest I have gone with out a charge). The vibrate is enough to let you know that there is a call, but not so much to freak a person out. The display has the time, battery life, and 'headphones' for if you are connected. Pressing either of the buttons brightens the diplay even more for better daytime reading (not necessary unless in full sunlight). The build quality of the watch is not too bad, the actual bracelet is decent and the clasp is strong enough to not worry about. I hated the word bluetooth so much, that I took the whole thing apart, scraped the silk screen off and blackened the area out. It looks just fine now. If I had a suggestion to the maker, it would be to make 'window' smaller and bring the stainless steel right up to the display. It would simply look more sleek. If your doing an order, and are already paying the shipping on something else, its worth throwing one of these in. It really is much much better than the first gen of these. It matches the "Iron Samurai' on my other wrist.